Another seminar has ended | NJNA is Blogging! Today Rosie and I completed our classes for this, our second, seminar. 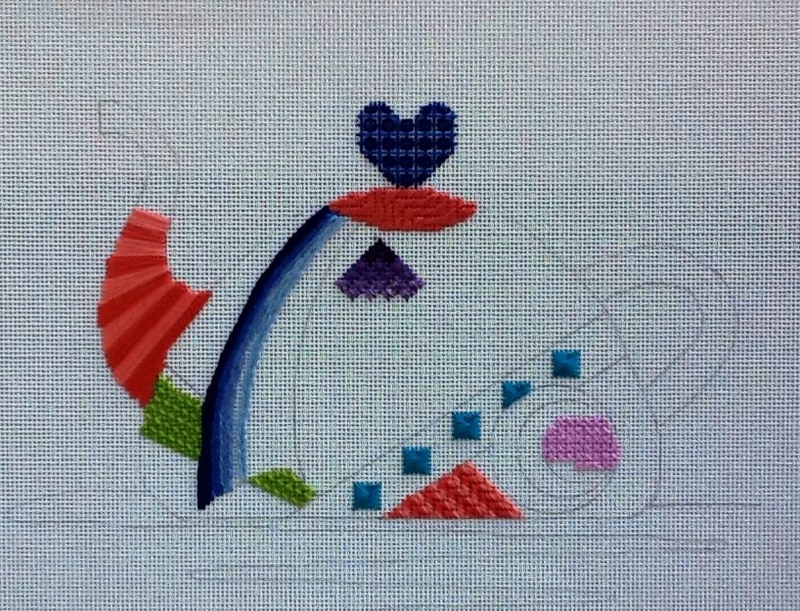 Hot Pot was a fun piece to stitch and one I anticipate finishing. It was a learning experience for me as I had to compensate not for a straight edge, but for a CURVE, not my favorite thing! And more than one curve as you can see. I feel comfortable about finishing this piece on my own and I would definitely take a class from Dawn Donnelly again. This evening was the closing banquet. Rosie and I sat with a group that included members from the Kansas City chapter, both current and former, including a teacher, Toni Gerdes, as well as Ann Carol, who we met last year at seminar. It was a good table that included us in their conversations. Dinner was fine with an awesome chocolate dessert–no menu was included so I have no clue what it was. Then came the announcements, opportunity basket winners, and awards. They also told us the money that was made during the seminar for ANG which included $77,000 from the two auctions, silent and live. The online bidding really boosted the results according to one insider I spoke with. The opportunity baskets raised over $4,000. At the opening banquet we were told a out an initiative to raise money for the Golden Threads for the celebration of ANG's fifty anniversary. At this seminar they raised $100,001 towards this foundation. You can see there is some wealth among the needlepointers! The committee co chairs for Chicago in 2014 made an excellent PowerPoint presentation selling us on Chicago, what the city has to offer from museums to parks to music to needlework shops to food. It was amazing. That plus the classes being offered make me want to attend in August, 2014! Hope you have enjoyed our view of the seminar for this year and hope that there will be more attendees from NJNA next year in Chicago!